An extraordinary life starts with an extraordinary education! Thank you for your interest in All Saints’ Day School. Choosing a school is one of the most important decisions you will make, and we are dedicated to providing a helpful and friendly admission process for you and your family. The early and middle school years lay the foundation for a lifetime of learning. We are proud to be the only independent school in the area concentrating exclusively on these important years in your child's development. Come find out why we focus on Preschool-8 education, and why we know it's important. We think you'll agree. Here at All Saints’, children from Preschool age through Eighth Grade are inspired to discover the joy of learning, as well as to develop their individual potential. Enriched academics and small group teaching reinforce our students’ desire to learn, challenging them to think critically and to develop self-confidence. Our beautiful setting above the Carmel River, with playgrounds, spacious fields and the organic garden, inspires creativity and enables our students to do their best, both in and out of the classroom. Our graduates are well-prepared and eager for the challenges of high school and beyond. The best way to find out more about All Saints’ is to come for a visit. If you would like to visit us, please contact us and we'll schedule a personal tour of our campus. In the meantime, please explore our website, where you can learn more about the programs and activities our school has to offer, and discover for yourself Why All Saints’? We can't wait to meet you and your family, and look forward to discovering what a good match your child and All Saints' can be. All Saints' families that have more than one child concurrently enrolled in the school will be offered a $1,000 tuition reduction for the second (and each additional) child. What is All Saints’ looking for in a prospective student? All Saints' is seeking students who are intellectually curious and who will flourish in our community as they are inspired to discover their talents and passions. All Saints' students are surrounded by the opportunities inherent in our challenging academic program, our many fine and performing arts offerings, our sports teams, and leadership roles, and we are looking for applicants who will thrive in this environment. We welcome students of all races, cultures, religions, and socio-economic backgrounds. When is the best time to start the admission process? The ideal time to start is during the fall or winter months prior to the school year you wish your child to enter. There may be openings for new students during the spring and summer months. Please contact our admissions office at admission@asds.org for more information. Does All Saints’ offer financial aid? Tuition Assistance is available and is granted based on a family’s need. You can learn more by visiting Tuition & Financial Assistance. Does All Saints’ accept applications after the stated deadline? Applications are accepted after the stated deadline (February 2, 2017) and applicants are screened based on space available at the desired grade levels. Please see How to Apply. All Saints’ offers a variety of after-school opportunities. School athletic teams for students in grades 6-8 compete against other middle schools year-round in a variety of sports: soccer, girls' volleyball, basketball, tennis and golf. Arts offerings in photography and ceramics, also for middle schoolers, are available throughout the year. Performing arts opportunities abound - each fall, middle school students rehearse after school for the annual Shakespeare play, and in the winter and early spring, students in grades 3-8 may participate in the Spring Musical, a major highlight of the year, with rehearsals on Wednesday afternoons after school. Please visit these links to learn more: visual and performing arts, music, and dance, as well as athletics. What schools do graduates attend after All Saints’? Our students do extremely well in high school admission placement. Many of our All Saints’ graduates are accepted into and attend one of the local independent high schools. Some students attend independent boarding schools, primarily on the East Coast, and others attend local public and parochial high schools. Are students involved in community service? A tradition of service is at the core of the All Saints’ experience and mission. Students in every grade participate in community service, with projects such as weekly Bean Bagging for the farm labor families, preparing meals at Dorothy’s in Salinas, singing at a local retirement community, and donating toys, food and clothing to needy families at Christmas and Easter. Yes, as one of the means of maintaining the school's respectful learning environment, uniforms are worn by students in all grades. Guidelines are based on the premise that proper student attire reflects a sense of self-esteem and concern for others. For more about the dress code, please contact the Admissions Office. How does All Saints’ differ from a public school? All Saints’ is a not-for-profit educational institution guided by its mission and governed by a voluntary Board of Trustees. Being an independent school, it not only meets and exceeds the California State Standards, it retains the right to enrich its own curriculum through the arts, technology and more. Funded by tuition and charitable contributions, All Saints’ receives no public funds and has control over the education which is provided. Class sizes tend to be smaller than those in public schools, with students receiving more individualized attention. The National Educational Longitudinal Study (NELS), conducted by the U.S. Department of Education, reveals that larger percentages of students in independent schools are enrolled in advanced courses than in public, parochial, and other private schools and students go on to enroll in college at higher rates. They are also more likely to volunteer and become involved as citizens. 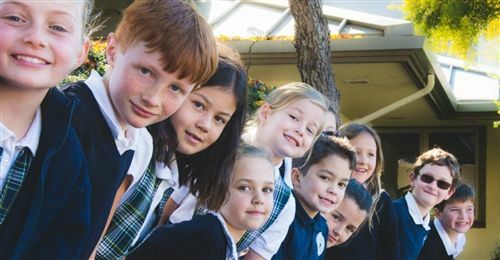 All Saints’ Day School meets the high accreditation standards of the National Association of Independent Schools NAIS and the California Association of Independent Schools CAIS.